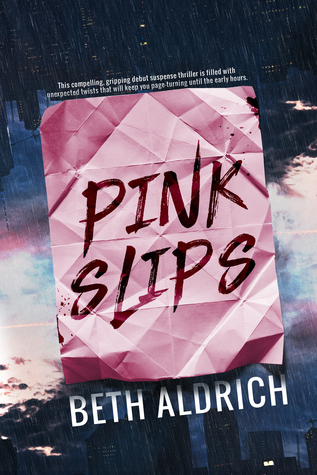 Pink Slips is a riveting tale of one woman’s desperate plight to keep her loved ones safe, even in the sights of a mysterious stalker with an unsettling amount of determination. From the outside looking in, good-humored Betsy seems to have it all – a beautiful home, a dapper and doting family, a successful career as a gourmet chef, and even a fabulous little furry companion. Still, looks can be deceiving, and in the complex life of Betsy, a storm is breaking. Author Beth Aldrich masterfully weaves the unbounded strength of family and friendship into the tense mix of danger and pursuit, making this as heartfelt as it is chilling. Truth be told, the emotional personality of this novel had me enamored immediately. The story opens warmly, inviting you directly into Betsy’s thoughts as she gleefully ponders over the fresh news of her first pregnancy. Her inner monologue is so charmingly real, and it was easy to imagine her gossiping to me with excitement for the little bean just beginning to grow within her. Unfortunately, life is often a blend of both miraculous beauty as well as senseless cruelty, and as Betsy is strolling through a parking lot, she’s interrupted by a mugger fixated on her handbag. This encounter feels as tragic as it does plausible, as raw moments like this unfortunately happen every single day. Reading along, my eyes began brimming with tears as I absent-mindedly gnawed off the tip of a fingernail. Aldrich has made such beautiful work of tapping into Betsy’s personal thoughts, gripping me with her fear in that moment. As the first chapter came to an end, I found myself hurriedly turning the pages, awaiting the fate of our beloved mother-to-be. There is a famous saying to the effect of “What does not kill you makes you stronger,” but in tender Betsy’s case, stronger would be better replaced with “paranoid”. Years of meditation have served to soften the edges of her anxiety, but some trauma you just never fully recover from. When suspicious pink notes begin arriving in her life boasting threats, Betsy is forced to revisit the fear of that fateful night in the parking lot. She has worked diligently to create the loving and comfortable home around her, and it’s no surprise that she isn’t willing to let that be endangered twice. Again, I found myself furiously chewing at my own nails as I cheered her on, anxious of the long list of suspicious characters possibly behind the ominous pink slips. Luckily, Aldrich writes with a bright wittiness that balances the heaviness of the theme, or I wouldn’t have had any nails left by the end. Aside from being endearing, this story is also incredibly digestible, despite being so darkly thematic at points. I read it in a mere two sittings. I really can’t pen enough praise for Aldrich’s cheeky and personal writing style. Even in the throes of a deranged stalker, each main character sports such flavorful personality that the novel stays warm and engaging throughout. I can’t wait to catch another title from this author.